A 3-way lamp, also known as a tri-light, is a lamp that uses a 3-way light bulb to produce three levels of light in a low-medium-high configuration. A 3-way lamp requires a 3-way bulb and socket, and a 3-way switch. 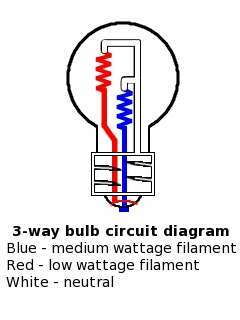 Unlike an incandescent lamp controlled by a dimmer, each of the filaments operates at full voltage, so the color of the light does not change over the three steps of light available. Certain compact fluorescent lamp bulbs are designed to replace 3-way incandescent bulbs, and have an extra contact and circuitry to bring about similar light level control. The contacts of a 3-way bulb. A 3-way incandescent bulb has two filaments designed to produce different amounts of light. Some compact fluorescent lamps have similar circuitry to produce the different amounts of light. Circuit diagram of a 3-way bulb. A standard screw lamp socket has only two electrical contacts. In the center of the bottom of a standard socket is the hot contact (contact one in photo), which typically looks like a small metal tongue bent over. The threaded metal shell is itself the neutral contact (contact three in photo). When a standard bulb is screwed into a standard socket, a matching contact on the bottom of the bulb presses against the metal tongue in the center of the socket, creating the live connection. The metal threads of the bulb base touch the socket shell, which creates the neutral connection, and this is how the electrical circuit is completed. A 3-way socket has three electrical contacts. In addition to the two contacts of the standard socket, a third contact is added. 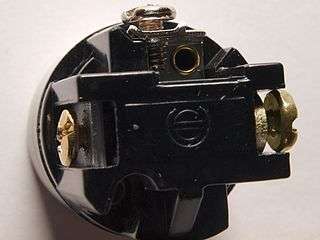 This contact is positioned off-center in the bottom of the socket (contact two in photo). This extra contact matches a ring-shaped contact on the bottom of a 3-way bulb, which creates the connection for the second filament inside the bulb. 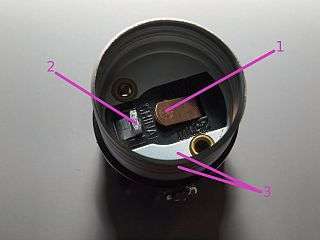 A problem of these devices is that the ring contact of the socket (contact two in photo) digs into the lead seal on the lamp bulb's contact ring and this connection tends to fail early (sometimes in months), leading to intermittent flashes, popping noises, and loss of power to the low wattage filament as the lead seal on the bulb's ring alternately melts and solidifies. The center contact of the bulb typically connects to the medium-power filament, and the ring connects to the low-power filament. Thus, if a 3-way bulb is screwed into a standard light socket that has only a center contact, only the medium-power filament operates. In the case of the 50 W / 100 W / 150 W bulb, putting this bulb in a regular lamp socket will result in it behaving like a normal 100W bulb. A 3-way socket that is to be wired to a separate 3-way 2-circuit switch, is called a "keyless 3-way socket." This would be typical in a 3-way floor-standing torchiere lamp. A "keyed 3-way socket" has the switch incorporated in the lamp socket and requires no external wiring between switch and socket. The switch used to control a 3-way lamp is usually a rotary switch or a pull-chain switch. Although it is referred to as a 3-way switch, it has four positions, off, lamp one (low), lamp two (medium), and lamps one and two (high). When properly connected to a 3-way socket containing a 3-way bulb, this switch will first power one filament, then the other filament, then both, then return to the off position. To do this, the switch must be capable of operating two different circuits. Internal to the switch there are two sets of switch contacts that are not connected electrically, but which are connected mechanically in such a way that they operate together as shown in this table. 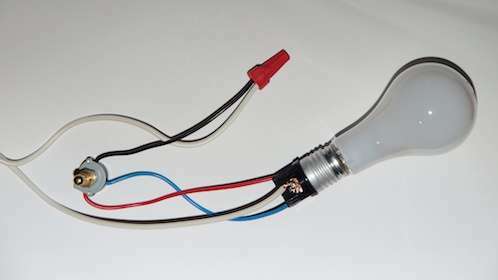 Wiring a 3-way lamp is a simple matter of connecting the 3-way switch's two switched live wires (frequently red for the low-wattage circuit and blue for the medium-wattage circuit) from the switch to the two live terminals on the 3-way socket. The lamp's power cord must be connected so that the wire from the wide blade on the power cord plug (neutral) connects to the neutral terminal on the socket, and the wire from the narrow blade on the plug (hot) connects to the black wire on the switch. Another type of 2-circuit lamp is also fairly common. This is the lamp with night light. While related to a 3-way lamp, this lamp is different from a 3-way lamp in both its intention and the parts it uses. The main intent of a lamp with night light is not to offer three levels of light, but rather to offer only two levels: a bright working light, and a very dim night light or decorative accent. Typically it does still use the 3-way 2-circuit switch. However, instead of having one 3-way socket, it uses two regular sockets. A lamp with night light is often configured so that one of the two sockets is a medium-base socket, considered to be the Main Lamp (under the lamp shade), and the other socket is a candelabra-base socket that is the night light or decorative accent light. The night light is usually placed somewhere on or inside the body of the lamp. In a typical set-up, the main lamp would have a 150 W medium-base bulb, and the night light would have 7 W candelabra bulb. The operation of the switch is still the same, such that the night light comes on, then the main lamp, then both together, then it goes back to off. Sometimes a 3-way 2-circuit switch is incorporated together with a regular socket, to be used as the main lamp socket in a lamp with a night light. In this configuration, the switched lamp one live terminal for the night light socket is exposed externally on the base of the socket, to be wired to the remote candelabra socket. Hence, this type of socket has a Hot terminal, a Neutral terminal, and a switched Hot terminal. This creates a confusing situation in which a keyed 3-way socket (which has a 3-contact socket at the top of it) has only two terminal screws, while a night-light socket (which does not have a 3-contact socket at the top) has three terminal screws on the base.